This is the front-piece of the 4th Annual Statewide Festival program held in Fresno in 1949. It was designed by two most charming ladies, Mildred Buhler from the North and Terry McDonald from the South. It would still today be considered a model of good design. The interior of the program consisted of six pages, detailing in excellent taste information of interest to the dancers. We are unable to duplicate by copying the beautiful brown and gold coloring of the program exterior. 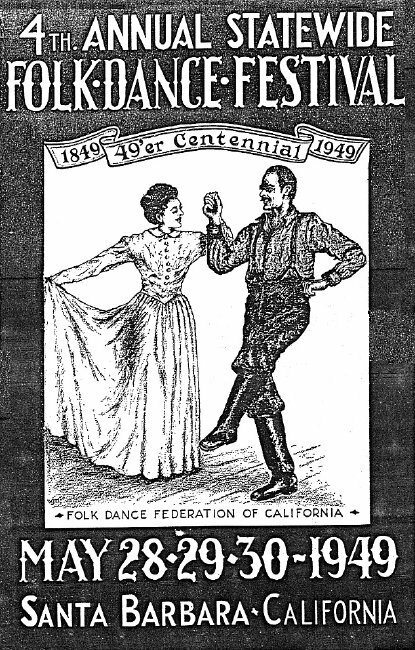 The 1949 Statewide Folk Dance Festival took place at the same time the 1949 Centennial was being celebrated in Santa Barbara. While our Statewide was not officially recognized as a part of the Centennial Celebration, we did contribute to the festivities taking place in Santa Barbara. We had the opportunity to witness some of their activities and especially applauded our Early California costumed governor, Earl Warren, along with his loveley first lady, both of whom took part in one of the Parties. Chairperson for the Statewide was Bill Herlew, a most affable fellow, who I had personally met at Stockton Folk Dance Camp the previous year. In fact, we were roomates of sorts along with 10 to 15 other fellows who were berthed in one of the poorly ventilated quanset huts, hurriedly built during World War II. Bill Herlow actually dates back to World War I where he was a sailor in the German Merchant Marine during the early stages of the war. While on leave in a South American port, he jumped ship. After making his escape he worked his way north, finally reaching the United States, where in due time he became a citizen. This, along with other stories, made my short stay with Bill most interesting to say the least. 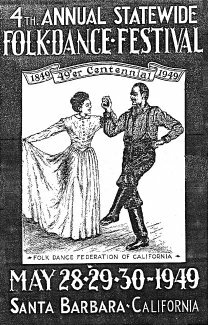 Now with Bill chairman of the 1949 Statewide Folk Dance Festival, we, as friends, found reasons to correspond back and forth as we worked out details of the upcoming Statewide. The Festival dates were May 28, 29, and 30, the Memorial Day holiday, falling on Saturday, Sunday, and Monday. Registration took place Saturday morning followed in the afternoon by the Teacher's Institute at the Recreation Center. The first half of the Institute was taught by the South with the North taking over for the second half. Twelve dances were taught in all. Those making the most impact, at least for we northeners, were "La Cucracha" by Terry McDonald, "La Mestecita" by Carolyn Mitchill, and "Spanish Waltz" by Terry McDonald, all teachers from the South. They had come into their own, for sure. The opening Saturday evening program was held in the National Guard Armory with the North contributing most of the exhibitions. On Sunday afternoon we moved outdoors to Peabody High School Stadium. Dancing on the grass was considered quite ethnic even though it was a bit tiring. Here four dance groups from the South put on dazzling displays along with equally interesting exhibitions from Northern groups. Not only was the quality of dancing excellent but the costuming was also outstanding. Sunday night we moved to the National Guard Armory and danced from 8:00 to 12:00 p.m. Again there was a generous number of exhibitions and one began to wonder where they all came from. But the Folk Dance movement was at it zenith, especially in the North, and one could find a folk dancer under every rock. The Monday morning Evaluation Meeting was chaired by Walter Grothe. It was originally agreed this was the most outstanding festival so far, as well as the best attended. Not satisfied with all the activities offered on the program, many of us discovered "Mom's," a most delightful club run by a middle aged couple, truly a "Mom and Pop" show. We were allowed to set up our equipment and danced up a storm during after hours and in and between activities otherwise scheduled. We sort of took the place over for a couple of days and for those of us who discovered the place, the memory lingered.